Joe Jonas is the middle member of the Jonas Brothers, the popular teen pop-punk band. Joe plays guitar and swaps lead and backing vocals with his younger brother Nick; the third band member is their older brother Kevin. The brothers are known for their religious background (their father, Kevin Sr., is an Assembly of God minister) and their clean-cut, fun-loving image. 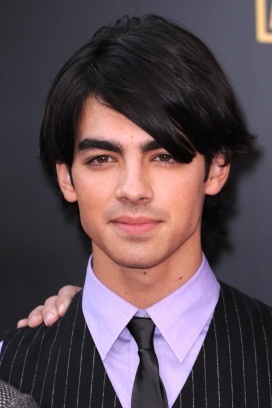 Female fans regard Joe as the handsomest member of the group, thanks in part to his romantic lead role in Camp Rock, the 2008 Disney TV movie that put the band on the map. (“This is Me,” Joe’s duet with Demi Lovato from the film, was a hit single in the summer of 2008.) The brothers also starred in the Disney series Living the Dream, a semi-documentary of their 2008 U.S. tour. Joe is about two years younger than Kevin (b. 1987) and three years older than Nick (b. 1992). Another brother, Frankie (known to fans as the “bonus Jonas”), was born in 2000… Joe Jonas is 5’9″ tall, according to a 2008 report on TV.com… Other famous people born in 1989 include soccer star Freddy Adu and golfer Michelle Wie.